If you’ve visited our Salem office in the new year, you may have seen a new face. We’re thrilled to introduce Dr. Courtney Melchione, who is joining the staff of Invision Salem for the next few months! Courtney met Dr. Scott Mann at a Virginia Optometric Association meeting after graduating from Southern College of Optometry. After moving back to the area, the doctors at Invision heard she was looking for part time work, and offered her a position at Invision Salem! This isn’t the first time we’ve written about Courtney. 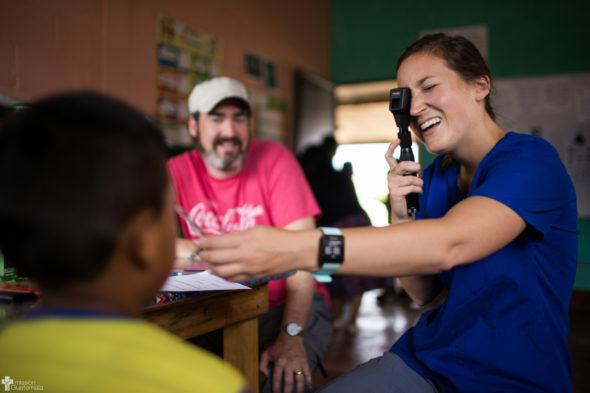 In 2016, we featured Dr. Melchione before she embarked upon an incredible two year journey providing eye care in Guatemala. Courtney hopes to specialize in speciality contact lenses and anterior segment disease (diseases that impact the front third of the eye, including the lens, iris, and cornea.) “Specialty contact lenses are generally able to improve the vision of patients with corneal disease much more effectively than glasses, many times restoring their vision to a functional and comfortable level,” she explained. While gaining further experience and helping our practices, she’ll be applying to residencies in order to pursue her goal. While she’ll be with us for only a short period of time–through April, before she’s off to her next adventure–we’re absolutely thrilled to have her her in our Salem office! Be sure to say “hi” to Dr. Melchione during your next visit, and help us in making her feel at home at Invision! Image provided by Mission Guatemala. New to Invision or just want more info? We make it easy for you.